The International Spy Museum in Washington, D.C. has offered a unique insight into the world of espionage and secret services since 2002. It houses the world’s largest collection of exhibits on this subject. 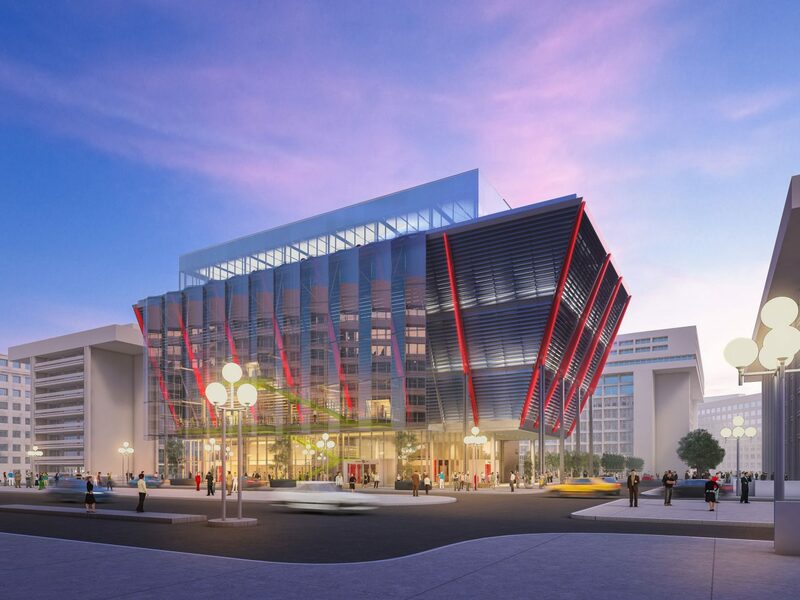 The previous building in Washington had serious limitations, so the museum management took the decision to build a new, ultra-modern and representative building in a very prominent place – the middle of the “L’Enfant Plaza”. The idea was for visitors to be enthralled by the architecture alone. An eminent London-based architectural practice designed a building envelope which is completely sealed and yet highly transparent. The covert and visible aspects of espionage activities are shown on the actual building. The conceptual design of the transparent section of the building uses a zigzag facade which hangs in front of the closed part of the building like a glass veil and encloses the visitor staircase at the same time. The transparency required by the customer is achieved by a combination of thin, high-strength laminated panes of glass. A filigree steel construction provides for the requisite static load carrying capacity, without appearing conspicuous in the foreground.